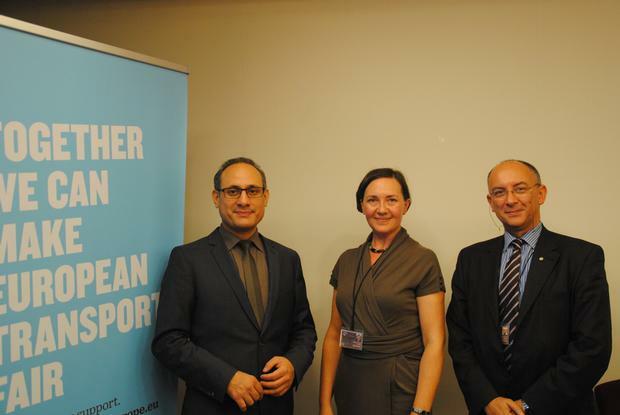 On 13 October 2015, MEP Ismail Ertug welcomed the ETF in the European Parliament (EP) to present its set of proposals on better law enforcement in road transport. The event was attended by Members of the European Parliament, press representatives and ETF member organisations. Setting the scene for debates and presentations, in his opening remarks Ismail Ertug pointed out that the main reason for the current problems in the road transport sector is the lack of law enforcement across the EU. “The proposal by the ETF completely conforms to what the Social Democrats in the European Parliament have criticised for many years: We do have comprehensive legislation in road transport, but it is not sufficiently enforced. The reason for this deficit stays partly with the European Commission, for not putting enough pressure on the Member States for a full and complete implementation of Community rules. On the other hand, Member States either do not implement legislation correctly, or are not ready to provide the necessary personnel and equipment to ensure thorough enforcement and controls. While at the EU level we are already discussing cross-border enforcement or exchange of information on infringements, some Member States still struggle to do this within their own regions”. The ETF stressed once again on the problems faced by the EU road haulage market. The sector needs an urgent rehabilitation of its ‘social’ behaviour, as well as a fair climate of competition between haulers. Social dumping and cutthroat competition have made the sector totally unattractive for potential new-comers, and have led many road operators out of business. The event is one in a series of activities meant to promote the ETF set of enforcement proposals. The ETF envisages various meetings with European Commission services and, in the near future, will seek to organise concrete actions involving the European Parliament and the Member States.